While we were enjoying a delightful and fraternal dinner at a restaurant near his Immaculate Conception residence in Albuquerque, Fr. Tom Steele, S.J., eminent scholar of all things New Mexican, made a surprising announcement to me in mid-January 2008. We were at the time collaborating on primary source materials relating to Padre Martinez of Taos, but the announcement had nothing to do with the famed Cura de Taos. With a twinkle in his eye and nascent smile, Fr. Tom said, “I have discovered a hitherto unknown santero”. Father Steele (RIP) is a recognized authority on the history of NM and in its various expressions of culture including santos and santeros who fashion them. I was, of course, curious about who this new santero might be. In New Mexican parlance, santos refer to saints’ images carved in wood (bulto) or painted on a wooden slab (santo) or on another medium perhaps such as ox hide. I was greatly surprised and intrigued when Father Steele revealed that this new santero was Francisco Xavier Romero whose name I recognized as a distant ancestor! Father Steele discovered him in 1993 while studying paintings made from rock minerals and vegetable dyes on ox hides. In the Jubilee Year 2000, Father Steele–author of several books–wrote an essay on Francisco Xavier with the view of future publication. He gave it to Mr. Tom Chavez, an expert on such paintings and former employee of the Palace of the Governors in Santa Fe. He is also an historian as well as nephew of Fray Angelico Chavez, the famed New Mexico historian, poet, and prolific author. In his essay, Father Steele made the case that Romero is to be identified with “Franciscan B” as listed in some New Mexican art catalogues. Among a collection of these painted ox hides housed at the New Mexico History Museum within the Place of the Governors. <http://www.nmhistorymuseum.org/hides/>. The Segesser Hides are the most famous works within the collection made up of two categories: Segesser I depicts skirmishes between rival Pueblo Indians and Apache Plains Indians between 1693 and 1719. Segesser II depicts a rout of Spanish soldiers and allies in 1720 in the area of present-day Nebraska. There is a Jesuit connection to this collection that may have triggered the special attention Fr. Steele S.J. paid to the ox-hyde paintings. Fellow Jesuit priest Philip von Segesser von Brunegg of Switzerland obtained painted ox hides in 1732 from the prominent Anza family of Sonora. One of their illustrious members, Juan Bautista De Anza, in 1774 set out to search for an overland route from Tubac, Sonora to Monterrey, the capital of Alta California. His an expedition included 20 soldiers, 11 servants and 3 padres that returned from their successful expedition in 1777. As a reward, the Spanish Viceroy of New Spain appointed de Anza as the Governor of La (Custodia de) Nuevo Mexico which at the time also included the present-day states of Arizona, Utah, Colorado and parts of Wyoming. <https://en.wikipedia.org/wiki/Juan_Bautista_de_Anza> One of De Anza’s signature exploits as Governor of La Nuevo Mexico was his 1779 defense of Taos in the mountains of northern New Mexico. Together with Utes and Apache Indians as allies, Govenor De Anza defeated marauding Comanches under the leadership of Cuerno Verde. He remained as Governor of New Mexico for eight more years, and then returned to his home-base of Sonora. He was put in charge of the Presidio of Tucson in 1788, but died within the year before taking up the new office. The family name of Padre Felipe von Segesser, S.J. exudes wealth and class now poured out in service to vocation and mission. Padre Felipe followed in the footsteps of fellow Jesuit missionary Padre Eusebio Francisco Kino, the great pioneer-evangelizer (as well as geographer, explorer, cartographer and astronomer) who served in Sonora and Arizona for 24 years until his death in 1711. Both priests were from wealthy families of the old Hapsburg region of Trent in the liminal territories of northern Italy, southeast of Switzerland and southwest of Austria. In 1758, Padre Felipe serving in Sonora sent the paintings to his family in Switzerland. The Palace of the Governors in New Mexico borrowed the hides for an exhibition in the mid 20th Century, and purchased them in 1988. Francisco Xavier Romero, the “hitherto unknown santero”, is presumed to have been one of those who painted on these hides in the late 17th and early 18th centuries. 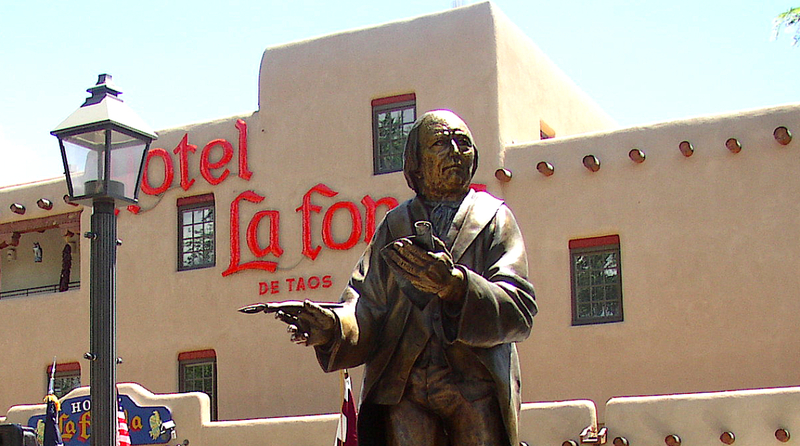 He was one of the founders of the village of Santa Cruz that Spanish settlers established north of Santa Fe in 1693, after returning from their thirteen-year exile following the major 1680 uprising of Pueblo Tribes. Santa Cruz is near the junction of two rivers Chama and Rio Grande. The Okay Oingue Pueblo had been located there since the fourteenth century. When Spanish colonizers arrived in 1598, they called the pueblo San Juan Caballero. Adjacent but across the Rio Grande to the east, they established their own colony and named it in honor of San Gabriel. Francisco Xavier Romero had collected vellum documents and kept his own manuscripts written on sheep skin and handed down to heirs through the eldest son of succeeding generations. From his own father Miguel Romero, my grandfather and namesake Juan B. Romero (Grandpa Jon as we called him) came into possession of the manuscripts, a family heirloom, sewn together in a book. In turn, Grandpa Jon handed them down to my father, José Tobias Romero, the eldest of his siblings. However, my Uncle Tom, my father’s younger brother by seven years, having earned a Master’s Degree in Spanish literature, had a greater interest in them. Without objection, Uncle Tom took possession of the vellum tome, researched its contents well, and eventually translated the Francisco Xavier Romero documents. The fruit of Uncle Tom’s scholarly labor can be found at the State Archives of New Mexico in Santa Fe. Father Tom Steele, S.J. quotes from Uncle Tom’s work on Francisco Xavier Romero. Uncle Tom, together with his brother–my father–had been a boyhood sheepherder. After a stint with the Civilian Conservation Corps when he was a young man, Uncle Tom joined the Army Air Corps–predecessor to the U.S. Air Force–and became a turret-ball gunner. He flew twenty-five successful Missions from England over Germany and was decorated with the Distinguished Flying Cross. On the G.I. Bill, Uncle Tom earned a Master’s degree in Spanish at NM State University in Las Cruces. With his family, he later moved to California where he taught Spanish on every level until his retirement. His grown children challenged him to finally translate that water-stained sheaf of vellum documents of Francisco Xavier Romero. At their urgings, Uncle Tom, after his retirement as a professor of Spanish, finally completed the difficult task of translating the FXR documents, a series of letters testifying to his surgical skills and good reputation. However, he was even more strongly motivated for the task by a prior negative injunction by dean of New Mexico historians Fray Angelico Chavez while a guest speaker at the University where Uncle Tom was earning his degree. Tom asked Fray Angelico about Francisco Xavier Romero, and the priest –to hear Uncle Tom tell it– curtly replied, “You best forget about him!” The response upset and angered Uncle Tom who was aware of the vellum parchments as documents precious to family lore. Francisco Xavier was quite expert in the use of a SCALPEL, a skill that “cut across” or perhaps through his many endeavors, talents and occupations. That he may have been a scoundrel and perhaps a sinner is more than suggested in the correspondence that nevertheless attests to a good reputation. Francisco Xavier was foremost a surgeon and barber who knew blood-letting/phlebotomy, a therapy used at the time. FXR was also a shoemaker–cutting hides for teguas, i.e., moccasins. He was a sacristan at San Felipe Church, formerly known as San Francisco Xavier Church, at the corner of Romero and Church Streets in Old Town Albuquerque. Finally, FXR was a santero–cutting hides by the vara (about 3” less than a yard) upon which holy pictures or other images might be painted. Francisco Xavier Romero was certainly well-regarded by the parishioners of San Felipe de Neri church when it was still known as San Xavier Church. He had served as sacristan and as the parishioners’ surgeon and shoemaker. When the governor was about to sentence him for his alleged indiscretions, the people of the parish prevailed upon the governor to pardon the sentence so that FXR could continue to serve there. Francisco Xavier donated many religious artifacts both to the church of San Felipe and to the church of Santa Cruz de La Cañada located between modern-day Española and the santuario of Cimayó. Thank heaven Uncle Tom disregarded Fray Angelico’s exhortation to “Best forget about him”. Or perhaps better still, thank God that the exhortation to forget instead provoked the reaction to REMEMBER the ancestor, and vow to attempt his rehabilitation for family honor. God alone is judge as to what extent Francisco Xavier was a scoundrel-sinner or pious man, even an un-canonized saints in heaven. I’m confident that FXR, the “hitherto unknown santero” had within him–as do we all– some of each of those categories. May the merciful Lord grant us all pardon and peace! This last year has been the “Year of the Priest,” and it culminated this last Friday, a week ago with a very special celebration of several thousand priests from all over the world who were gathered in Rome around Pope Benedict XVI at the giant plaza of St. Peter’s Square at the Vatican. It was a time to repent of our collective sinfulness in failing fidelity to our vocation, and to acknowledge our dependence on God for his loving kindness, mercy and forgiveness. It a was a time for re-dedication of our lives to the call that the Lord has given us to spend ourselves in loving service of God and His people. It was God’s good time (kairos–moment of grace) to renew our priestly lives and ministry. It was the feast of the Sacred Heart of Jesus, source of God’s loving kindness, compassion, and mercy. After almost a year of not being able to publicly celebrate Mass on a regular basis because of my heart attack last August, I once again began doing so with great joy. It was like a “First Mass,” and I was especially pleased to do so in the parish where I began my priestly ministry more than forty-six years ago–St. Alphonsus Parish in East Los Angeles, near the corner of Atlantic Blvd. and Whittier Blvd. In fact, I am staying for these few weeks of June in the same room that I occupied as a newly ordained priest in 1964. Indeed, it is like re-entering mother’s womb, a new birth. May the Lord accompany me in this personal physical “re-birth,” and in the henceforth more regular postings on the life and legacy of Padre Martinez. During the down time of recuperation, I have continued research and writing on the life and legacy of Padre Martinez, and have collaborated with Vicente Martinez and Father Tom Steele. I hope to renew some past postings that have disappeared into cyberspace, and post new items recently written as well as future postings waiting to be penned. I invite you to check out this blog with some regularity, and to spread the word about it. May it become as interesting for you to read it as it is interesting and fun for me to put it together.